I’ve noticed that the predictive text options on my phone have been much better than I expected. Sometimes I’ve been able to send SMS messages without having to type more than the first word. This gave me the idea for Predictive Tweets, a game you can play with your friends. As a game this is quite simple. No app, no bloatware, just a twitter client on your phone. type their name or twitter handle at the beginning of your predictive tweet. 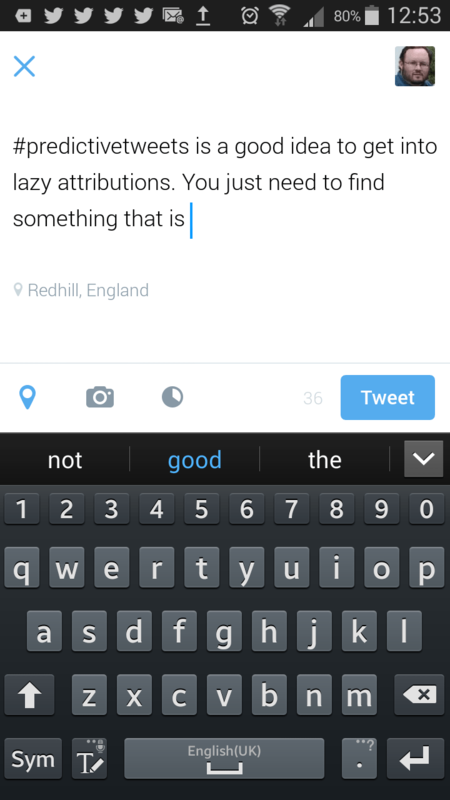 Use only predictive text options available to you from on your phone to finish the tweet. Keep sending Predictive Tweets until you get a WTF or they work it out. Use the hash tag #predictivetweets on the predictive tweets when your friend has twigged. Once your friend realises something weird is going on get them to send predictive tweets to other people. Use the hash tag when explaining the rules. What I have found with this is that if you just pick the default option then it tends to start looping after a while. It seems to have a circle of words. However you can mix it up by making use of the words either side of the main option when it looks like it is getting into a loop. Post your own favourites in the comments section please. The Secret of Success or Snake Oil?